Spring is bamboo shoot time. In spring, the young bamboo, called takenoko, begins to poke out of the ground, and the bamboo shoot is a harbinger of spring for Japanese people. In spring, they are cut before they are more than 25 centimeters tall. At this size, they are still tender. And in Japan, as in many countries in Asia, they're part of the cuisine. 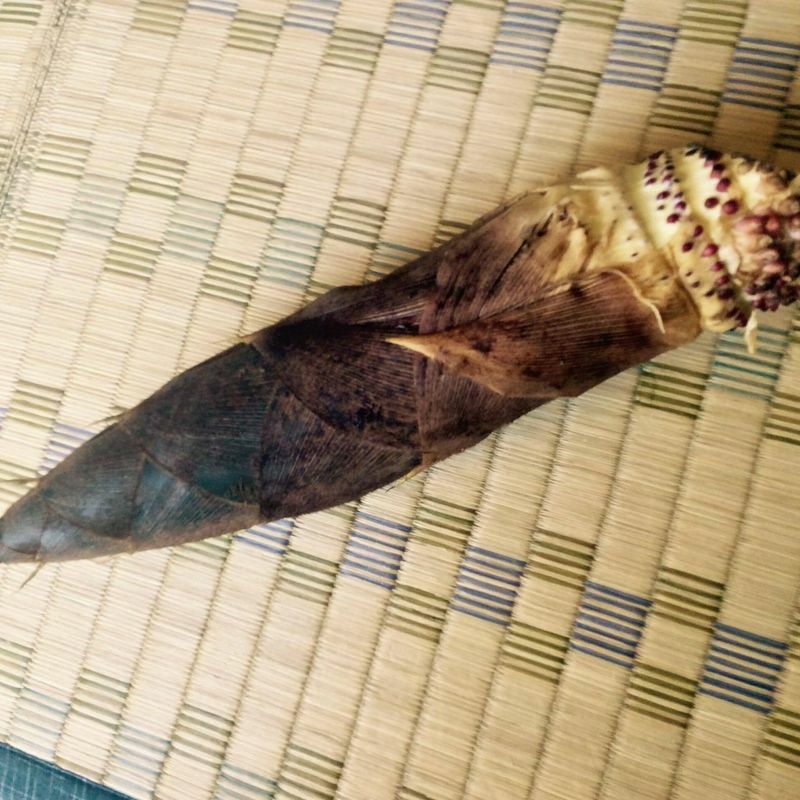 I was gifted this beautiful bamboo shoot, but you can also find them in the supermarkets in March and April. Mine still had the dirt on it, so I scrubbed it and cut the bottom off. Japanese friends advised me to peel off just the outer layer, as the bamboo skin helps to tenderize it as it cooks. Care must be taken to cook the bamboo shoot sufficiently. Raw bamboo has a compound that when eaten, breaks down into cyanide in the human gut. I am familiar with thorough cooking of otherwise toxic vegetables because my family has a tradition of using casava (the root that makes tapioca) in our cooking. You have to do this right. The Japanese way of cooking bamboo shoots uses either the water left over from cooking rice, or rice bran, called nuka in Japanese. Either way, this is supposed to add alkaline to the water to counteract the toxic compound. 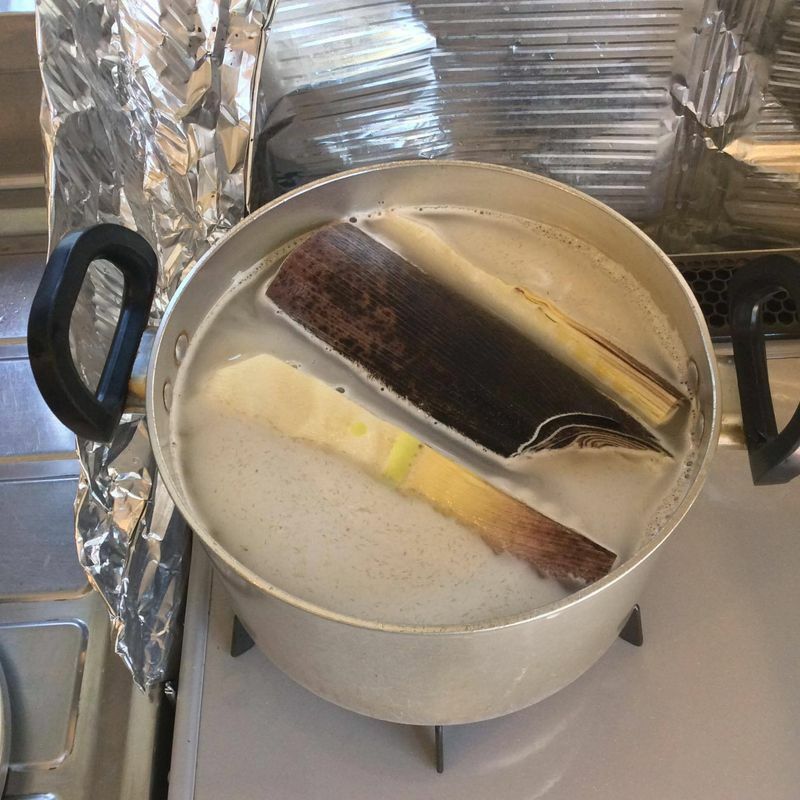 I boiled my bamboo shoot in a lot of water with rice bran added. It takes about 60 to 90 minutes to boil them. You know the bamboo shoot is done when you can stick a skewer into it. Let the bamboo shoot cool before your try to cut it to prepare it for dishes. One dish that is easy to make is bamboo shoot simmered in kombu broth with wakame. It makes a good side dish. 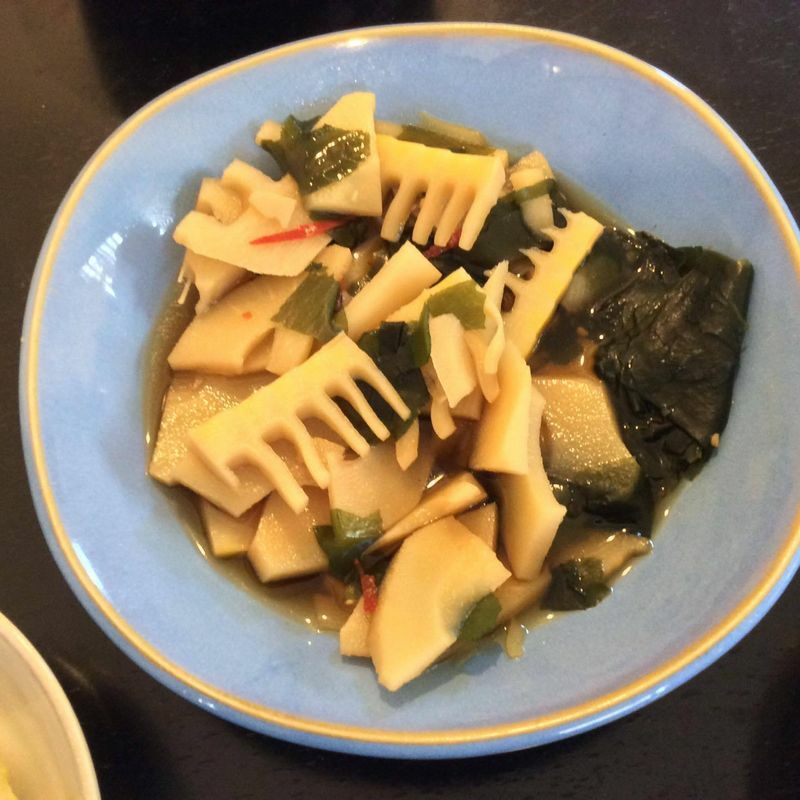 The texture of the bamboo shoots is firm, and it has a distinct and slightly bitter flavor. 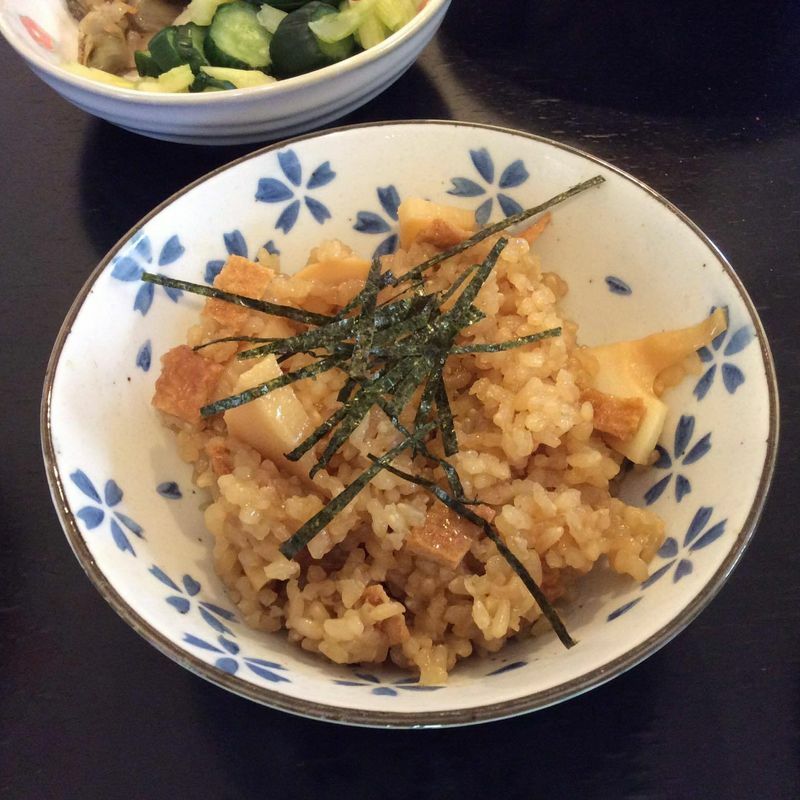 Another way to use bamboo shoots in Japanese cuisine is takenoko gohan. Put your rice in the rice cooker with the chopped bamboo shoots, a little soy sauce, a dash each of mirin and sake, and some sliced shiitake mushrooms. Cook them in the rice cooker as you usually do. Most people recommend brown rice for this dish. You can add bamboo shoots to all kinds of stir fried dishes, too. I acquired a taste for Thai curry from trips to Thailand to visit family where they taught me some Thai home cooking. Later I learned from a Thai neighbor lady that bamboo shoots are good in Thai green curry. I do my green curry with whatever is available - bunashimeiji mushrooms, green peppers, bamboo shoots and chicken. It takes a little time to cook fresh bamboo shoots, but it is pretty easy to do. Just cook them long enough.